Zucchini has been gracing the booths of the farmer’s market for several weeks now. I’ve picked some up each Saturday, usually to use in simple pasta dinners or grilled alongside chicken or fish. This week I decided it was time for some zucchini bread, and knew just the recipe I wanted to modify to accommodate the green squash - Molly Wizenburg’s banana bread from A Homemade Life, which I made several weeks ago. Now, admittedly, I didn’t substitute zucchini in this recipe for its flavor. Its so mild on your palette that the stronger flavors of dark chocolate, ginger, cinnamon and cloves overpower its delicate scent. What I wanted from the zucchini was the moisture that the banana typically provides without adding an additional competitor to the mix. You see, while Molly’s recipe was quite good, for me the combination of banana, chocolate and ginger was a bit overwhelming. Maybe its because I am a banana bread purist, and want the banana to be the center of attention even when complimented with another ingredient like apples or dates. I did, however, love the idea and taste of chocolate and dried ginger combined together in a loaf, and decided to seek out another way to utilize it. Enter the zucchini, and a few other substitutions that I like to make to any bread recipe I re-create. White whole wheat flour in place of all-purpose, turbinado sugar in place of refined, fat free greek yogurt in place of regular whole milk yogurt. 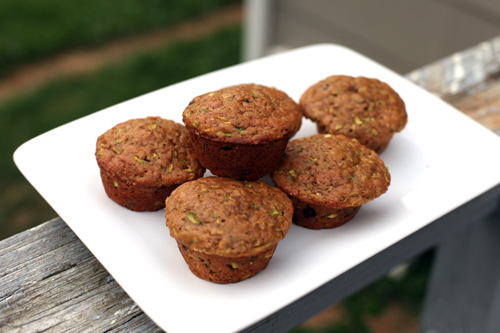 Throw in a couple of additional spices (cinnamon and clove) and a 12-cup tin instead of a loaf pan and the result is a muffin that is perfectly moist, not too sweet, hearty enough for breakfast yet satisfying as a dessert with a tall glass of milk or hot cup of tea. Because these muffins are very moist, I suggest eating them within 3 days if you’re going to keep them on your countertop in an airtight container. Refrigeration would probably save them from mold for a few days longer, but I didn’t try that so I can’t tell you what happens to their texture. I did freeze 1/2 the batch though, and am hoping that Molly’s claim that her bread freezes extraordinarily well will extend to my muffins. If you’re interested in the original banana bread recipe, you can find it reviewed here. 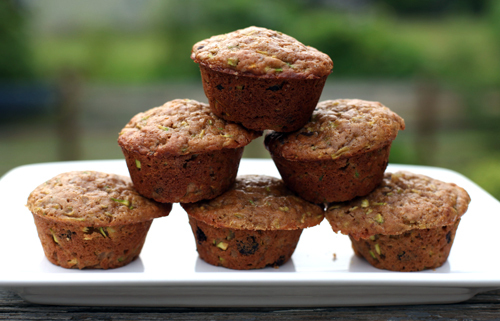 If you fill the cups to the tip-top, you will be left with 12 delicious yet oddly-shaped muffins. Fill them 3/4’s of the way full, and you’ll probably have enough batter left for two additional muffins if its worth it to you to dirty another pan. I didn’t mind their appearance, since they were just for Brian and I to share. Set a rack in the center of the oven and preheat to 350*. Grease a 12-cup muffin tin with cooking spray or butter. In a large bowl, whisk together the flour, sugar, baking soda, salt, cinnamon and ground cloves. Add the chocolate chips and ground ginger and stir well to combine. In a medium bowl, lightly beat the eggs with a fork. Add the yogurt, melted butter and vanilla and mix well. Add the zucchini and stir to coat. 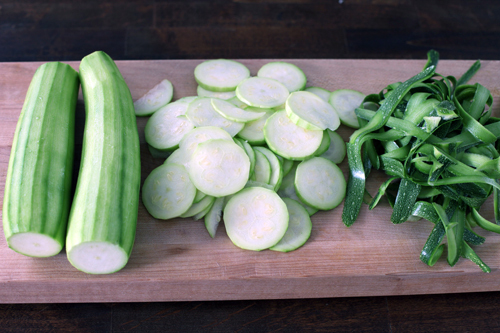 Pour the zucchini mixture into the dry ingredients and stir gently with a rubber spatula until just combined. Make sure to incorporate all flour but do not overmix. Spoon the batter into wells of muffin tin, using spoon to pack it down. If you don't want your muffins to overflow like mine did, just fill the wells to 3/4 of the way to the top. This will leave some batter leftover, but only enough for maybe 2 muffins. If you don't mind oddly shaped tops, just fill the wells evenly until you've used all of the batter. Bake for 25-30 minutes (mine took 28 minutes), until a tester inserted in the middle of a muffin comes out clean. Cool in pan on wire rack for 10 minutes, then remove muffins from pan to cool completely on rack.